Bank Buildings, which housed Primark, seen as recently as last month. Pic: Arthur Allison Pacemaker. The good news is that nobody was injured. But it is the only good news. The fire that engulfed Primark yesterday has destroyed one of the key businesses in Belfast city centre. 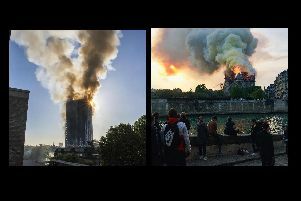 It has also destroyed one of its finest buildings. In the process, it has put an end to an expansion plan that would have led to hundreds of new jobs. Think of the teenager who was about to begin perhaps their first job in the newly extended Primark. Or of the person who had been appointed manager of a section in the improved store. All such people were about to begin a new chapter in their own lives and in that of the famous business. The building itself (‘Bank Buildings’), is a later building on the site of a bank that was completed in 1785. It was one of Belfast’s grandest buildings. They simply do not build to that quality now. Even a billionaire would struggle to find the £100+million it would cost to construct a replica with such brick and stone. This is why even newer buildings that win architectural awards are invariably cheaper structures than the fine 19th century buildings that dominate the beautiful heart of our capital city. Not only will hundreds of jobs be lost, but also the trade of (on some days) thousands, of people who went to Primark. For many of them, the absence of a specific major store they want to visit is a make or break factor as to whether they even go into Belfast. Only weeks ago the city breathed easy after the future of the popular House of Fraser store in Victoria Square was first in doubt, then assured. Aside from the terrorism of the 1970s and 80s, there has barely been a blaze of this scale in Belfast in the last half century. A smaller fire destroyed Waterstones on Royal Avenue, and it never reopened. Not only did the Primark building survive the Troubles, when the IRA bombed many buildings, it also only just survived the 1941 German Blitz. For decades a nearby High Street plot was vacant and unused, known as ‘Blitz Square’. It has taken Belfast a long time to put the twin horrors of war and terror, and resulting economic damage, behind it. When I arrived on the scene yesterday at midday, the fire was raging in the roof but by 12.30pm seemed to be confined to the top. Later it was clear it was not contained, and that the whole building was engulfed. At 4pm the interior was still burning fiercely.